John Bell was born in 1939 in the old Mission Hospital. He lived on Mitchell Avenue in West Asheville for the next 25 years. He credits his childhood friend Sid Parker with pointing out that he grew up in an “Ozzie and Harriet family.” During the Second World War, he made the rounds of the neighborhood with his father, an air raid warden, checking to make sure all the lights were out. He had the freedom to ride his scooter to the A & P grocery store. His was a neighborhood in which “lots of people had influences on kids.” He cited George Prosser, a relocated Englishman, with teaching him “how to go out to the woods and see something other than trees.” In those days, he says, “You didn’t worry about people stealing.” The worst thing he could think to say about his childhood home was walking out on a Sunday morning and passing Lavonne’s, the drive-in that is now Franklin’s Outdoor Sports, and seeing the white gravel thrown out in Haywood Road the previous evening by cars peeling out of the lot. When Bell graduated from Lee Edwards High School in 1957, his dad issued a warning: “You’re not going to sit around all summer. Either go to college or join the service.” John reflected that “I’d had about enough of school at that point,” so he joined the Army. He quickly learned the difference between the geniality of West Asheville and the reality of the larger world: “I didn’t know about the rest of the things going on until 1957.” He spent the next three years in France. Bell began closely following racing during this time, often working in the shops of racers Banjo Mathews and Roy Trantham. He also went to the races down at the Speedway “‘bout all the time.” He took particular interest in a young Randy Bethea, encouraging his attraction to racing. Bethea went on to become the first and only Black NASCAR driver to win a Busch series pole. In 1963, Bell met Patricia Allen at a car show. He reports that she said, “If you need anybody to polish your trophies, give me a call.” They were married two years later. Shortly thereafter, with a wife, a house, a business, and two girls to raise, “there was no time for racing.” Bell took to working on “show” cars, taking them to Charlotte and Greensboro. 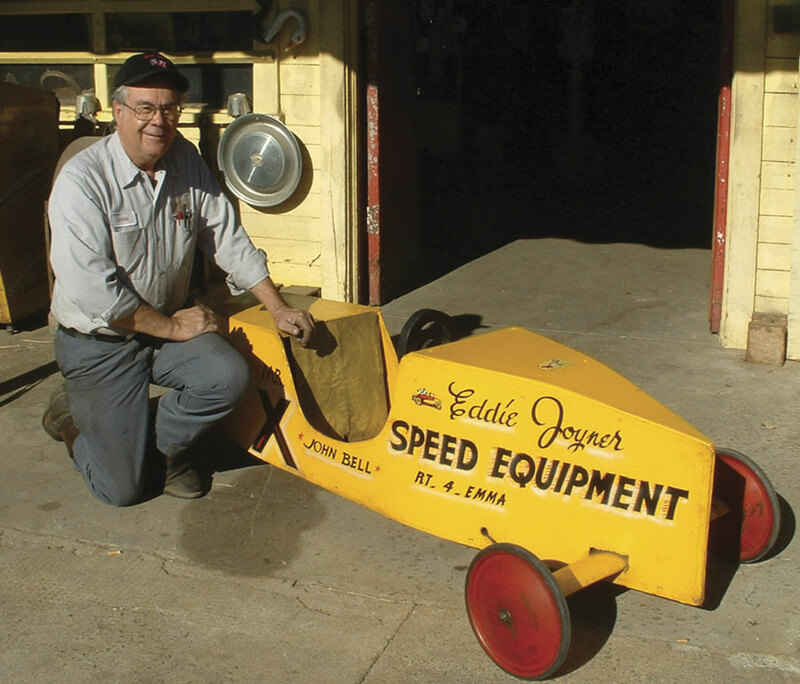 John Bell with his 1953 soapbox derby entry. Photograph by Reid Chapman.